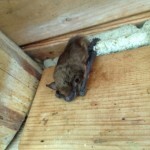 Do you know or suspect you have bats living in your attic? Tri-State Wildlife Management specializes in permanently resolving bat issues for people like you! Call today to set up an inspection appointment. Bat Removal: The courteous staff at Tri-State Wildlife will work for you to provide a cost effective solution to your bat issue. As a full service company, we will initiate an Integrated Bat Management Plan beginning with an inspection and customer education followed by removal and exclusion of intrusive bats, clean-up, repair/restoration, and prevention. Tri-State Wildlife Management is a full service company, and will take care of every aspect of your bat problem, from identifying entry points and at-risk areas, excluding bats, sealing vulnerable areas, and cleaning up bat guano and debris. We also offer bat and wildlife deterrent chimney cap installation. We are fully insured, and we stand behind all of our work. Bat Removal Covington, KY: Like every fall, Tri-State Wildlife Management (TSWM) is busy with bat work, including bat inspections and bat exclusion. Now is the perfect time to take care of any bat problem you may have before bats begin hibernating in your attic. Bat exclusion work involves sealing and repairing all current bat entries and exits, as well as all other construction gaps on your home. TSWM repairs all construction gaps on your home because they are areas susceptible to future bat entry. Once bats are prevented from using their current entry and exit points, they will attempt to gain access to the structure by other means. Sealing up vulnerable areas prevents bats from gaining access back into your home. Got Bats? 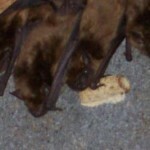 For bat removal in Covington, KY call the experts at Tri-State Wildlife Management. Put our experience and expertise to work for you! Covington, KY Bat Removal and Exclusion Bats are great mammals to have around, as they hunt mosquitoes and other insects at dusk, just when insects’ presence are at their climax. However, bats become unwelcome guests when they find a nice comfortable home in your home or business, entering through construction gaps, unsecured louver vents, chimneys, or any hole larger than 3/8 inches. If your home or business is occupied by bats, you may witness bats going in and out, or bat droppings (guano) underneath the bats’ main entrance(s). Homes and buildings are great places for bats to use as hibernating sites and as maternal roosts (a place to raise their young before they are able to fly). What should you do if you find yourself sharing your home or business with bats? 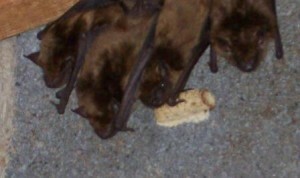 Tri-State Wildlife Management (TSWM) is your solution to your bat problem. Our courteous staff will work for you to provide a cost effective solution to your bat intrusion or damage issue. As a full service company, we initiate an Integrated Management Plan beginning with a full bat inspection and customer education followed by bat removal and exclusion, clean-up, repair/restoration and prevention. 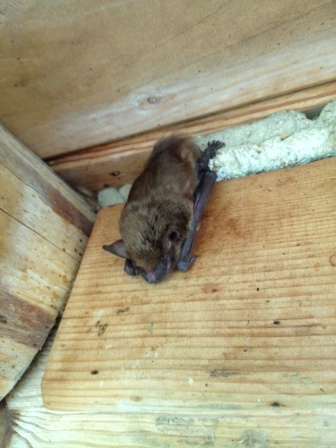 The removal process used by TSWM allows for bats to exit your attic while preventing reentry. During this process, no bats are harmed and they easily find another place to lodge. Bats are protected under federal and state law; however, TSWM has the expertise and experience to offer legal and humane exclusions and repairs. A bat’s seasonal cycle, such as roosting and dispersal periods, affect how and when they can be removed from your home or business. For example, TSWM will not seal up the main bat entry into your attic if juveniles are too young to fly, or if bats are hibernating. In both circumstances, bats will be trapped inside, causing unnecessary death, as well as an associated odor. In the winter, full bat exclusion is not permissible until mild nighttime temperatures return in early spring. Sometimes we experience a 1-2 week warm spell in the winter. If this happens, TSWM can take the opportunity to fully exclude bats. When temperatures warm up, bats leave their hibernation site to hunt, therefore ensuring no bats are trapped inside. Posted in Bats | Comments Off on Got Bats? Covington KY Bat Removal: In our area, bats typically hibernate the winter long, the exception being warmer winter days when you may spot a bat(s) outside. Bats often take advantage of the comfort of attics and chimneys, both in the winter and the summer. Crevices of homes make perfect hibernation spots in the winter and maternity colonies or roost sites in the summer. With winter right around the corner, now is the time to rid your attic of bats. If bats have access to your attic now, they are sure to use it as their hibernation site in the colder months. Fall is the perfect time to remove and exclude bats from your home or business, since bats are not yet hibernating, and all the young born this year are able to fly. Once cold weather sets in for good, full bat exclusion falls into a blackout period. During this time, construction gaps and secondary entries can be repaired on structures, but it is important to always keep a main entry open for bats to fly in and out. These main entries must be kept open until spring when all bats are sure to be active in the evening (in which they will fly out of your attic to hunt). Tri-State Wildlife Management (TSWM) uses special vents for the bat removal process which allow bats to leave your attic as normal to hunt while prohibiting reentry. After all bats have left your attic, permanent repairs are made to seal entry and exit points. Total bat exclusion (permanent repair of main entries) can restart again usually in early spring, but the date fluctuates from year to year, depending on the weather.